When Led Zeppelin III was released in October 1970 music critics gave the album mediocre reviews. This had been the case throughout their career. Critics didn’t seem willing to Led Zeppelin a fair hearing. For Robert Plant, Jimmy Page, John Paul Jones and John Bonham, this was hugely frustrating. Things got so bad that Jimmy Page refused to speak to the press for eighteen months. That wasn’t end of Led Zeppelin’s protest. Having recorded their fourth album between October 1970 and March 1971, it came to giving the album a name. The four members of Led Zeppelin decided that their fourth album would officially be untitled. There was a good reason for this. Led Zeppelin decided they wanted to remain anonymous. They also didn’t want to their music to be pigeonholed or stereotyped. This added an air of mystery to the album. So did the inner sleeve’s design. It featured four symbols. Each symbol represented each band member. With no official titled, Led Zeppelin’s fourth album became known variously as Four Symbols, The Fourth Album, Untitled, Runes, The Hermit, and ZoSo. However, since then, Led Zeppelin’s fourth album has been known as Led Zeppelin IV. Led Zeppelin IV is one of the next instalment in Atlantic Records’ reissue program. A deluxe remastered version of Led Zeppelin IV will be rereleased by Atlantic Records as a double album on 27th October 2014. 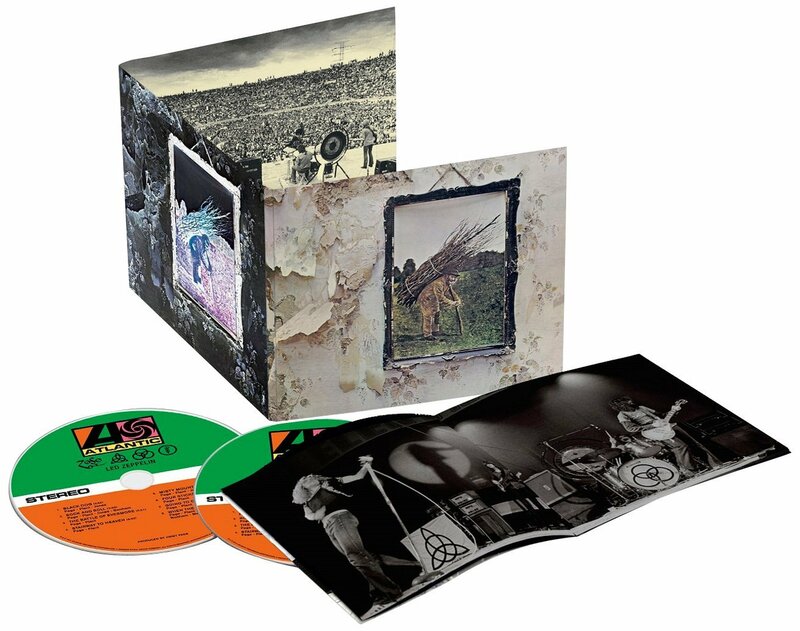 Disc one features the original version of Led Zeppelin IV remastered. Then on disc two there’s alternate versions of Led Zeppelin IV. This means that on disc two of Led Zeppelin IV the version of Black Dog is the basic track with guitar overdubs. It’s followed by an alternate mix or Rock ’N’ Roll. The version of The Battle Of Evermore is the mandolin/guitar mix from Headley Grange. That would close what was the end of side one of Led Zeppelin IV. Opening what would be the alternate version of Led Zeppelin IV is the Sunset Sound Mix of Stairway To Heaven. Just like the previous tracks, this shows another side to a familiar track. Having said that, nothing will match the original version of Stairway To Heaven. Alternate mixes of Misty Mountain Hop and Four Sticks follow, before the mandolin/guitar mix of Going To California proves a welcome addition. Closing this alternate version of Led Zeppelin IV is the alternate UK mix in progress of another stonewall Led Zeppelin classic, When The Levee Breaks. This alternate version of Led Zeppelin IV is a welcome addition to the remastered version. However, the main event is the original version of Led Zeppelin IV which was recorded between October 1970 and March 1971. As Led Zeppelin set about recording what became Led Zeppelin IV, the four members of the band had written their strongest album so far. The Jimmy Page and Robert Plant songwriting partnership cowrote The Battle Of Evermore, Stairway To Heaven, Four Sticks and Going To California. Jimmy Page and Robert cowrote Rock ’N’ Roll with John Bonham and Misty Mountain Hop with John Paul Jones. Led Zeppelin cowrote the other two tracks, Black Dog and When The Levee Breaks, which is also credited to Memphis Minnie. She is credited as having written the original song. These eight tracks became what’s referred to as Led Zeppelin IV. Led Zeppelin set about recording what would become Led Zeppelin IV in October 1970. The initial session took place at Island Record’s new recording studios in Basing Street, London. After that Led Zeppelin decided to move Headley Grange. On the recommendation of Fleetwood Mac, Led Zeppelin decided to move to Headley Grange. It was an old Victorian house in Hampshire. Led Zeppelin used a mobile studio belonging to the Rolling Stones. After the tracks had been completed, they returned to Island Records’ studio for overdubbing. Mixing of Led Zeppelin IV, which was produced by Jimmy Page, took place at Sunset Studios, Los Angeles. By March 1971, Led Zeppelin IV was completed. However, there was a problem. Once Led Zeppelin started mixing Led Zeppelin IV, they encountered some problems. The group weren’t happy with the mix, and they returned to London to redo some of the work they’d just finished in Los Angeles. This meant Led Zeppelin IV’s release date became delayed by several months. Indeed, Led Zeppelin IV wasn’t released until November 1971. Before that came the promotion of the untitled album. Now Led Zeppelin had finished Led Zeppelin IV, they could set about promoting it. First they had to decide the album’s title. Instead of giving the album a title, it featured four hand drawn symbols, on both the inner sleeve and record label. Each symbol was meant to represent a band member. Nor would there be any information on the album cover, with the band’s name being downplayed. This was almost unheard of, and many people at Atlantic, their record company feared that this would damage sales of the album. Before the album was released, Atlantic sent copies of the graphics to the press, so they could include the symbols in articles about the album. Since the album’s release, it has been referred to as Led Zeppelin IV, although that wasn’t the original title. However, the lack of a conventional title didn’t harm the album, or sales. Led Zeppelin’s reputation preceded them. Their appetite for the rock ’n’ roll lifestyle was legendary. Excess was encouraged within the Led Zeppelin camp. They wore their infamy with pride. Drink, drugs and debauchery was commonplace. So was destruction. The four members of Led Zeppelin weren’t averse to wrecking hotel rooms. Having trashed a room in the Tokyo Hilton, Led Zeppelin were banned from the chain for life. Hotel rooms weren’t just trashed. Television sets out of hotel windows. Another time, John Bonham rode a motorcycle the Continental Hyatt House, which Led Zeppelin nicknamed Riot House. However, when it came time to recording an album, Led Zeppelin put their game head on. That was apparent when Led Zeppelin IV went on sale. On the release of Led Zeppelin IV, across the world, the album sold in huge quantities. In Britain, Led Zeppelin IV. Over the Atlantic, Led Zeppelin IV reached number two in the US Billboard 200 and number one on Canada. Led Zeppelin IV reached the top ten in Australia, France, Germany, Italy, Japan, Norway and Spain. Gold and platinum discs came Led Zeppelin IV’s way. It was in America, Britain and Canada where Led Zeppelin IV was most successful. in America Led Zeppelin IV was certified platinum twenty-three times. Across the border, Led Zeppelin IV was certified double diamond in Canada. Over the Atlantic in Britain, Led Zeppelin IV was certified six times platinum. Led Zeppelin IV was certified gold in Brazil and gold three times over in Germany. In Argentina, Holland, Spain and Switzerland, Led Zeppelin IV was certified platinum. Led Zeppelin IV was also certified double platinum in France and eight times platinum in Australia. When executives at Atlantic counted the sales of Led Zeppelin IV, nearly thirty million copies of were sold. By far, Led Zeppelin IV was Led Zeppelin’s most successful album. However, what does Led Zeppelin IV sound like? Opening Led Zeppelin IV is Black Dog. After a hesitant start, before the track bursts powerfully into life. Robert Plant’s unleashes a lung bursting, unaccompanied vocal. This gives no indication of what’s to come. What follows is a masterclass in full on rock ‘n’ roll at its very best. Jimmy Page’s screaming, lightning fast, guitar playing, John Bonham’s frantic drumming driving the song along with John Paul Jones bass guitar. The tempo is fast, the sound akin to a wall of loud. As the song drives along, there’s occasional pauses, before the track builds back up, returning to the earlier frantic pace. You can’t help but admire Robert Plant’s vocal, it’s one part raw power, to one part sheer passion, as he almost screams and bawls his way through the track. Black Dog inspired a new generation of bands, but none of them canA brilliant way to open the album. How do you follow a classic track like Black Dog? It’s quite simple really, with one called Rock and Roll. It begins with Bonham playing a drum solo, that’s fast, full and power personified. After that, the group treat us to some old school rock ‘n’ roll. Plant’s gives his usual energetic and enthusiastic vocal, as the band turn back the years. Again, Jimmy Page’s guitar playing is peerless. He unleashes some blistering, screaming, howling guitar riffs. His playing is quick, accurate and sounds like something you’d expect Chuck Berry to play in years gone by. Behind him, John Bonham punishes his drums and John Paul Jone’s bass sits at the bottom of the mix. Later, Rolling Stone Ian Stewart lays down piano solo. A lengthy part of the track is just an instrumental where the group showcase why in 1971, Led Zeppelin were rock ’n’ royalty.. Together, the band produce a track that although relies on power, embodies the true spirit of rock ‘n’ roll. After two really rocky songs, Led Zeppelin change styles with The Battle of Evermore which features Sandy Denny on vocals. It has a distant, meandering start with Jimmy Page playing mandolin. Then Robert delivers the lead vocal accompanied by Sandy Denny. This is a very different track, it’s slower, with a folk feel and sound, especially with the instruments used and the way the vocal is sung. By now, it’s mandolin and acoustic guitar that are playing. There are no electric instruments used on the track, but one thing hasn’t changed and that is Robert Plant’s vocal. Sometime’s he cut’s loose, and unleashes a powerful, energetic vocal, especially towards the end of the song. Mostly, though, he resists this temptation, and it’s a much more restrained vocal from him, more in keeping with Sandy Denny’s vocal style. Although very different stylistically, The Battle of Evermore shows Led Zeppelin’s versatility. Probably the most famous song that Led Zeppelin ever recorded is next, Stairway To Heaven, an eight minute epic. It’s one of the band’s best known, and best loved tracks. An acoustic guitar is played slowly and gently, before a recorder plays. Robert Plant’s vocal is much gentle, as the track meanders beautifully along. As for the lyrics, they’re among the best on Led Zeppelin IV. After just over two minutes, the song starts to fill out, the arrangement growing slowly. A bass plays, guitars too, as Robert Plant gives one of his best vocal on Led Zeppelin IV. Things start to really take shape when John Bonham plays, his drumming much more restrained here. Eventually, drums, guitar and bass let loose. Another blistering guitar solo from Page takes shape and John Bonham’s drumming is much louder and faster. Then Robert Plant decides he’s had enough of the restrained vocal style, and gives another lung bursting vocal performance, just before the track ends. Overall, this was a career defining moment for Led Zeppelin, as it’s both a rock track, and one of the most famous and best loved songs ever recorded. After Stairway To Heaven, anything else will sound second best. However, Misty Mountain Hop is the track they chose to follow Stairway To Heaven. Keyboards, guitars and drums all play, before Robert Plant sings the vocal. They combine powerfully, driving the track along, with John Bonham’s drums at the front of the mix. Robbert Plant’s vocal is a powerhouse. He shows no restraint. Sometimes, he screams, hollers and roars his way through the lyrics. Behind him, the rest of the band similarly, forget about subtlety, and really let loose. Jimmy Page’s guitar playing and John Bonham’s drumming are key to the sound. They provide a powerful and dynamic backdrop for the vocal. Jimmy Page demonstrates just how great a guitar player he was, playing a stunning solo during the track. Robert Plant’s vocal launched a thousand wannabe impersonators, many of whom went on to form bands and have successful careers. However, there was and only ever will be one Robert Plant. Here, he and the rest of Led Zeppelin produce another slice of peerless, hard, driving rock music. Straight away, guitars and rhythm section combine to produce a loud, powerful and driven backdrop for Robert Plant’s vocal on Four Sticks. Although his vocal is forceful and loud, he’s somewhat struggling against the hard rocking arrangement. It’s loud, repetitive, full of power and energy. It’s an example of what Led Zeppelin do best. John Bonham’s drumming is among his best on Led Zeppelin IV. Quite simply, it’s loud, fast, accurate and powerful. Meanwhile, Jimmy Page’s guitar playing chugs along, it’s dynamic and dramatic with riffs aplenty, while Robert Plant shrieks, screams and wails, as he really forces the vocal. By the end of the track, you can’t help but admire the sheer power displayed by Led Zeppelin. What they produce is dramatic wall of sound, which Robert Plant copes admirably with, producing a dramatic and energetic vocal. An acoustic guitar, then mandolin plays when Going To California unfolds. Straight away, you realise that this is a very different type of song. Here it’s just acoustic instruments that accompany Robert Plant’s vocal. His vocal is much softer, gentler and is much more restrained. Here he doesn’t indulge in any theatricals, no howls, wails or hollers, just a thoughtful vocal, sung beautifully, against a backdrop of acoustic guitar and mandolin. 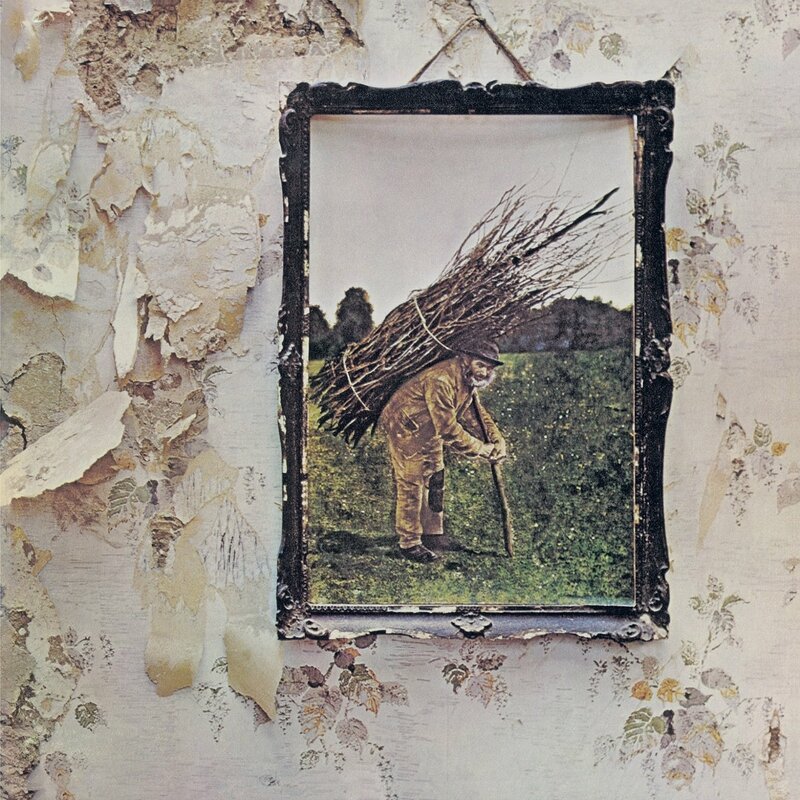 Led Zeppelin IV ends with When the Levee Breaks, a seven minute opus. John Bonham’s slow booming drums and a bluesy harmonica solo plays, join a screaming guitar. It solos, soaring above the arrangement. It’s an arrangement that builds and builds, and as it does just gets better. After a dramatic pause, Robert Plant’s vocal enters, seemingly, much more restrained. This doesn’t last, he soon breaks free of his shackles, and is roaring, giving a powerful, energetic and passionate vocal for the last time on Led Zeppelin IV. It seems Led Zeppelin have kept one of the album’s best tracks for last. This is a track with everything. Guitar solos, that screech, scream and howl, pounding, booming drums and a frenetic bluesy harmonica solo. Over seven minutes, the band really let loose, showcasing their talents as musicians, and demonstrating just why they were the greatest rock band of their era. Released in November 1970, Led Zeppelin IV was Led Zeppelin’s most successful album. It sold nearly thirty million albums. This was the perfect response to critics who consistently failed to give Led Zeppelin a fair hearing. A case in point was Led Zeppelin IV. If it was released today, critics would instantly realise that Led Zeppelin IV was a stonewall classic. Not back in 1970. Reviews ranged from lukewarm to positive. For a Led Zeppelin album, that was good. Led Zeppelin were far from a favourite among critics. So it’s no surprise that Jimmy Page refused to speak to the press for eighteen months. Another reaction to the treatment Led Zeppelin were receiving from the press was not giving their fourth album a title. For their fourth album, Led Zeppelin eschewed traditional marketing methods. They decided not to give the album a “traditional” title. What became Led Zeppelin IV was released at a time when Led Zeppelin hadn’t toured for a while. This meant Led Zeppelin’s profile wasn’t as high as it had been. That didn’t matter. Led Zeppelin IV was a career defining moment for Led Zeppelin. Led Zeppelin IV was the perfect response from Led Zeppelin. Since their debut album, they’d been a victim to the slings and arrows of outrageous critics. These critics seemed determined to sabotage Led Zeppelin’s success. They failed miserably. From the opening bars of Black Dog right through to When the Levee Breaks, Led Zeppelin have your attention. Led Zeppelin IV becomes like a musical fairground ride. All you can do is hold on and enjoy the ride. What follows is a mixture of blues, folk and Led Zeppelin’s unique brand of heavy rock. It’s played with power, passion and commitment, by four hugely talented musicians. They were in the peak of their career. It was as if everything had been leading up to Led Zeppelin IV, which is worth of being a called classic album. Nearly forty-three years after the release of Led Zeppelin IV, a deluxe remastered version of Led Zeppelin IV will be rereleased by Atlantic Records as a double album on 27th October 2014. This is the latest addition in the long overdue reissue of Led Zeppelin’s back-catalogue. Led Zeppelin IV finds one of the members of the infamous unholy trinity, Led Zeppelin, at the peak of their power, doing what they do best unleashing, their own brand of blistering, swaggering, Rock ’N’ Roll. ← UNDER THE INFLUENCE VOLUME 4-COMPILED BY NICK THE RECORD.